Eggs are oblong and slightly larger than the spherical eggs of spider mites. Nymphs are smaller and lighter in color but look like small adults. Predatory mites are red, orange, tan, or brown in color, pear-shaped, long- legged, and are approximately 0.5 mm long. They can move around quickly on spider mites colonies (unlike the spider mites that are almost stationary). They can consume about 30 eggs or 20 nymphs a day. Predatory mites feed voraciously on spider mites. They must have spider mites to survive and to reproduce. They do not feed on pollen or plant sap. They are very effective in proper crop and environmental conditions with temperatures ranging from 27-32 degrees centigrade. Predatory mite (Typhlodromalus aripo) controls cassava green mite (Monoychellus tanajoa). It can reduce the green mite population by œ and can increase cassava yield by 1/3. This predatory mite species does not require mass breeding in rearing station. It can be transferred to new locations on cassava shoot tips where mites are present. It can spread easily when introduced into cassava fields because of the many food sources such as mites, white flies, corn pollens, and honey dews. But in order to reproduce, it requires mite prey. In the absence of mites, predatory mite disperses or dies so that it causes no harm to the environment. 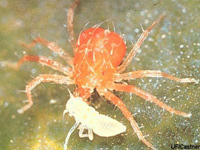 There are several species of predatory mites which are mass-reared commercially for the management of mites and thrips in greenhouses and field grown crops.